While your personal laptop is great at processing documents, surfing the web, and sending and receiving emails, it simply would not hold up in all environments. For instance, an oil field, or a combat zone in Afghanistan. For some applications, you simply need something a little more durable, and a little more rugged. A rugged server is designed to withstand some of the most extreme conditions on and off the planet. Here are some of the essential elements of rugged it servers. One thing that servers built for a rugged environment have in common with standard rack mounted servers is that they both usually provide leading edge capabilities in terms of data processing speed, data storage, and secure accessibility. The primary difference is one is built for a climate controlled indoor environment, while the other is not. One way in which rugged type servers can be customized is to resist shock and vibration. 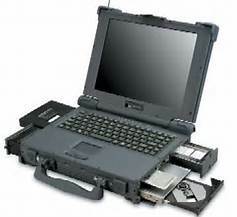 These usually have a gel-mounted disk drives or solid-state storage, and a thicker, more durable case. Nearly all rugged computers and servers have some form of shock absorption to protect the delicate internal parts of the system. For applications such as oil fields, military bases, and for use on heavy machinery, rugged computers are the way to go. Say you get an assignment for a research mission in the antarctic. Think your laptop is going to make it in those frigid conditions? Think again. Rugged servers have built in climate management solutions that keep your systems internal components operating in optimal conditions. This may be liquid cooled systems for extreme heat, or the best materials in thermal insulation for use at The Poles or anywhere cold. When used outdoors, computers have a tendency to get dirty. And when computers get dirty their internal systems get insulated with dust and debris, making them run hot and eventually burn out. A little accumulated dust is OK, but when used on the back of a Humvee your computer can become absolutely filthy. This is where the protection of a rugged casing around your server protects your technology investment. You can transform your iPad into a nearly indestructible tablet with a Shockproof Drop Resistance Super Protection Cover Case . If you are looking for an inexpensive, but environmentally tough laptop, the ASUS Chromebook C202SA-YS02 is an 11.6″ for under $200. But if you are serious about your computing needs, then the $1,300 Panasonic Toughbook CF-532JCZYCM 14-Inch Laptop may be more what you require. Between those two ends of the price spectrum is a very capable 8-Inch 32 GB Tablet from Vanquisher that is IP67 compliant and around $425. What is more, these servers can be completely customized for any purpose or rack size. Whether you need servers for your field command post or an on-vehicle rack-mounted system you are guaranteed to be delivered a solution that provides fast, reliable computing and data processing that withstands its environment. Sizes range from 1U to 4U and from 12.5” to 24”. Once you have found the right server provider for your needs, usually all it takes is a phone call to custom design your own server for the most extreme needs, environments, and conditions.